Please visit our ‘new look’ forum, we listened to your feedback and have made some changes to make it easier to use. The changes will also make it easier to use on mobile devices, smartphones and tablets too. Separate advertisements from the content – we have to have adverts to fund our free site, but now they are separated out more clearly. Don’t worry though we haven’t messed about with it too much – if you are regular users you will still be able to find what you need All the navigation and the structure of our forum is the same. We rely on experienced tradespeople and avid DIYers to help us moderate the forum to keep it safe and free to use for the many thousands of you that use it a month. Let us know if you want to become a forum moderator. 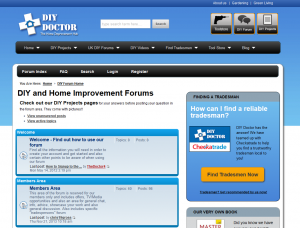 Thank you for using DIY Doctor and don’t forget we love to get your feedback on the changes to any part of the site, including the forum.